I am back with my latest book haul! This month I tried to cut back a little bit, and I am quite proud of myself for keeping my book buying under control! I really enjoyed this book! I did read it this month, but I also was part of the group of beta readers for this book. I definitely recommend this book to anyone who is looking for something a little different! I received this book from the author as a thank you, however all opinions are my own. I also read this book this month, and thought it was just okay. It was different and I really liked the idea behind it, but I just couldn't connect fully to the story or the characters. I don't know what it is about Gayle Forman's writing, but I just can't get into it. I tried reading If I Stay but I just thought it was juvenile and not really my cup of tea. I felt similarly with this story. I liked the concept but her writing just turned me off the story. Also read this one in February, I really liked it. It was a change of pace from the usual dystopian/romantic contemporary and I quite enjoyed that. I would definitely recommend this one as well! I am currently reading this one, but I am finding it to be a mix of Throne of Glass and Shadow and Bone. I picked up a bunch of Abbi Glines' books from Book Outlet and needed this one to start the series off. Similarly, I got the first one off of Book Outlet and wanted to continue the duology. I've already read this book, but I took it out of the library and wanted to own my own copy. I have been wanting to pick this book up for a while, the premise just sounded really interesting! So there you have it! 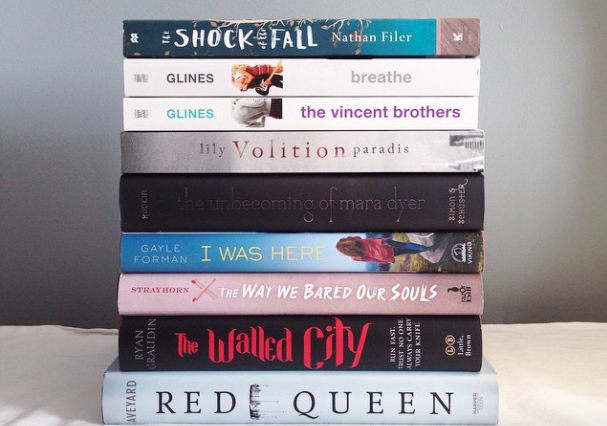 My February book haul!